Simple and cost effective store-front signpost. Gain passing trade through improved visibility. 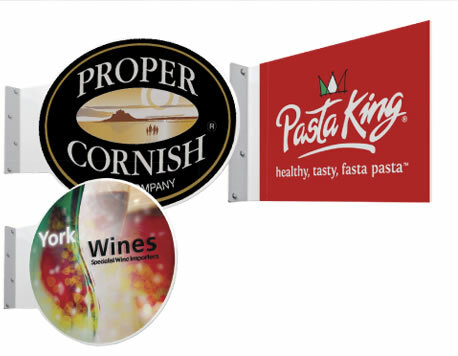 Double-sided powder coated aluminium with full colour printed graphics. Exceptional value, outdoor life in excess of 5 years. Available in 3 shapes round 495mm diameter, oval 500mm x 400mm and rectangular 575mm x 417mm. Special shapes can be made to order with a minimum order of 25.